A superb follow-up to his well-received Inspirations, Vol. 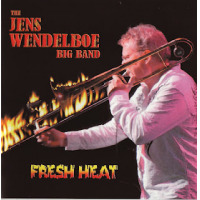 1 (Rosa, 2010) ensemble excursion, veteran trombonist, band leader, and award-winning Norwegian composer/arranger, Jens Wendelboe unleashes a little Fresh Heat from The Jens Wendleboe Big Band. The disc features contemporary interpretations of classic compositions by trumpeter Clifford Brown, saxophonist Joe Henderson, and bassist Steve Swallow, along with several originals. Wendelboewho grew up listening to the energetic sounds of the pop group Blood, Sweat & Tears (of which he is now a member), Chicago, and Tower of Powerbecame a convert to the brassy side of music, a sensibility influencing his arrangements and producing the "snappy, fresh and hot" contemporary sound on this burner of an album. The sixteen-piece Jens Wendelboe Big Band is the exact same group that recorded the previous album under the name the Big Crazy Energy New York Band, and is the latest incarnation of his original Norwegian Big Crazy Energy Band of 1991. The leader has an extensive resume composing for the film and television industry and, when not working there, lends his talents writing and arranging for jazz orchestras. Accordingly, the first three pieces of this set are fresh arrangements commissioned by the Westchester Jazz Orchestra. Clifford Brown's magical "Joy Spring" starts slowly with a lyrical introduction by vocalist Deb Lyons, then springs to life with sparkling solos from guest trumpeter Vinnie Cutro and saxophonist Joey Berkley. Co-producer and trumpeter Steve Jankowski joins Wendelboe on the dark-toned, yet propulsive "No Mercy," setting up one of the special moments with a sensational treatment of Henderson's classic "Black Narcissus," which features guest harmonicist Rob Paparozzi. The oft-recorded Rodgers and Hart standard "My Funny Valentine" provides another vocal opportunity for Lyons with tasteful support from the band, which holds back just a bit as the melody and tone of the chart requires. Wendelboe introduces a reprise of his Barga Jazz Competition Award-winning arrangement of Swallow's "Falling Grace," but also includes a spirited solo from David Anderson, playing electric bass as a tribute to the composer. One of the disc's highlights is Wendelboe's powerful "Nix Vogel," dedicated to the late Norwegian drummer Ole Jacob Hansen and featuring the prowess of Lee Finkelstein, in addition to many of the drummer's band mates. The album closes with "Suite to Bjorn," featuring pianist Bill Heller and Finkelstein, who turn up the heat with some funky sounds to accompany the fine orchestrations. This is another one of Wendelboe's prize-winning compositions, dedicated to Bjorn Kruse, Wendelboe's orchestration/composition teacher in Norway. It's easy to understand why Wendelboe likes the title of "Crazy Energy Band" when referring to his previous groups and recordings; his compositions and clever arrangements seem to produce a kind of high-energy crazy big band sound that Fresh Heat exemplifies so well.